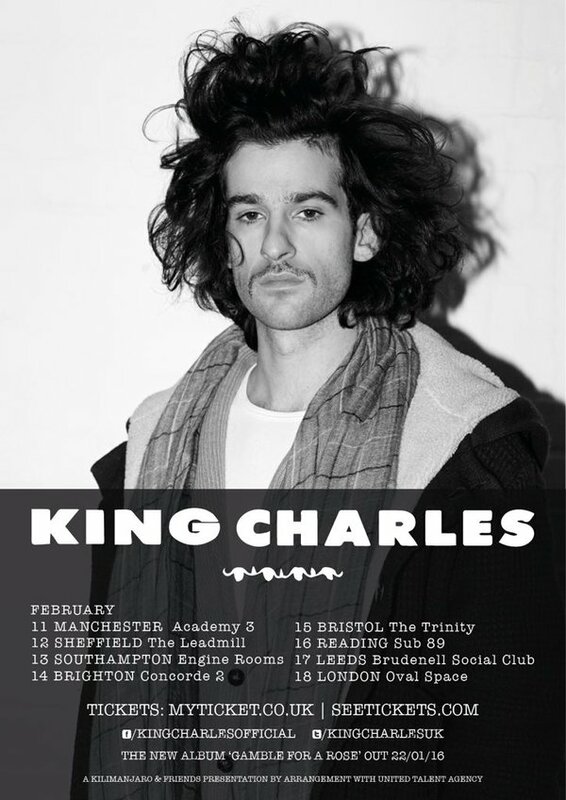 Best news... King Charles has just announced a tour in February to support the release of his upcoming second album, Gamble For A Rose. The tour will see him take in Manchester, Sheffield, Southampton, Brighton, Bristol, Reading, Leeds, finishing off at London's Oval Space on 18th Feb.
Having seen Charles live six times this year, I can tell you with confidence that the new tracks (the likes of Bright Thing, Loose Change For The Boatman and Choke) are sounding incredible and this tour isn't to be missed, Charles and his band put on such a fun live show. I was lucky enough to see Charles play a beautiful 7-track solo set for the Secret Sessions last night at London's The Hospital Club. The show had a great laid back atmosphere and it was great to hear some of the new tracks performed in this way - and lovely as ever to chat to Charles and his team - keep an eye out on the Secret Sessions page for the video sessions. Tickets for the tour are on sale from the ticket links on the poster above from 5pm tomorrow, and you can pre-order Charles' new album through his site here. Charles' next show is supporting the mighty Mumford & Sons at London's O2 Arena in a couple of weeks on 10th December.